Early iPhone 6 and iPhone 6 Plus shoppers are eagerly awaiting the arrival of their preorders this Friday, but a new report sheds light on how Apple's manufacturing partners are struggling to keep up with the sheer number of devices being sold. The Wall Street Journal today shed some light on what's causing this year's iPhone preorders to gradually slip later and later, with the iPhone 6 currently available to ship in seven to 10 days, while the 5.5-inch iPhone 6 Plus could be up to four weeks away. 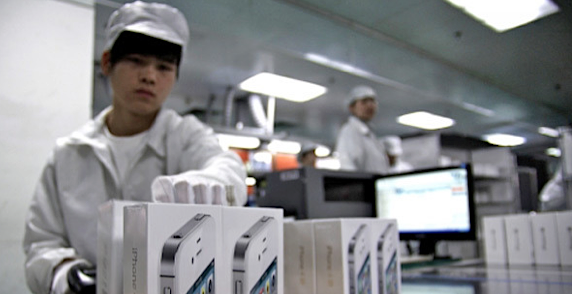 Taiwanese-based Foxconn has already employed more than 200,000 workers at its largest production plant in China's north central city of Zhengzhou, where both of the latest iPhone 6 models are being assembled — but apparently, that's not nearly enough to keep up with demand. “We have been churning out 140,000 iPhone 6 Plus and 400,000 iPhone 6 every day, the highest daily output ever, but the volume is still not enough to meet the preorders,” an unnamed source with knowledge of Foxconn's inner workings revealed. Foxconn has more than one million workers in China, with around 100 production lines running in Zhengzhou alone. Last year at this time, the supplier was exclusively assembling iPhone 5S handsets while rival Pegatron took the reins of the lower-end iPhone 5c, but this year Foxconn has been tasked with twice as many smartphones, both of which are in much higher demand. Between the two new models, the larger iPhone 6 Plus is said to be more scarce, which is being blamed on "a shortage of 5.5-inch displays" as well as a lower yield rate of only 50 to 60 percent, compared to the 4.7-inch iPhone 6 with an output rate of 85 percent. Things are likely to get worse for Foxconn before they get better: This Friday, September 19, iPhone shoppers will line up at retail stores across the U.S. and several other countries in the hopes of nabbing Apple's coveted smartphones, and the phones will ship to another 20 countries the following week.